The snow is melting, the weather is getting warmer, and everything is starting to look and feel alive again. Well, maybe not as alive as you would like it because your yard is a little brown from all that snow being on it this winter. Don’t worry, your lawn can make a comeback, and can be healthy in no time. Here are 3 spring lawn care tips that can help. There aren’t very many palm trees and cactus in Colorado. That’s because those plants thrive in different weather. If these plants were brought into Colorado, they would need a lot of attention to thrive, and even then their survival might be questionable strictly based on being in a foreign environment. Most types of grass are the same way. Grass is a plant that needs to be taken care of and attended to but depending on what climate your grass is in will determine how you take care of it. Colorado grasses are considered cool-season grasses. Danny Lipford and his team at Today’s Home Owner, note that cool-season grass has two growing periods, a moderate one in the spring and a huge one in the fall. So this spring, focus on studying up on what cool-season yards need to really enhance that growth period. Your yard has been hiding for what feels like forever, now that it’s ready to come out of hiding give it the attention it needs—but not too much attention. After you’ve studied cool-season grasses, you should have a good idea about how much food and water your grass needs to grow. Now is the time to put that into place. Fertilizing your lawn will not only help it grow lush and green, but it will kill all those potential unwanted weeds that make your lawn dull. Keeping weeds away keep allergies away too, so you want to get on top of that before your allergy attacks start. Overwatering, fertilizing, and caring for your lawn is harmful to it too. Your yard is soft from all the water absorption from the snow melting. Keep walking and intense raking to a minimum, so your lawn has a chance to grow happy and healthy. Aeration is the term for when lawn care professionals pull soil cores out of the ground and allow more air, water, and nutrients to reach the grass’ roots. Healthy roots lead to healthy grass, which makes a healthy lawn. Since cool-season grasses have a strong growth period in the spring months, it’s important to implement aeration tactics in the spring followed by seeding. Seeding right after aeration will allow the grass seeds to get down into the soil and have the best chance at growing to fill bare patches in your yard. 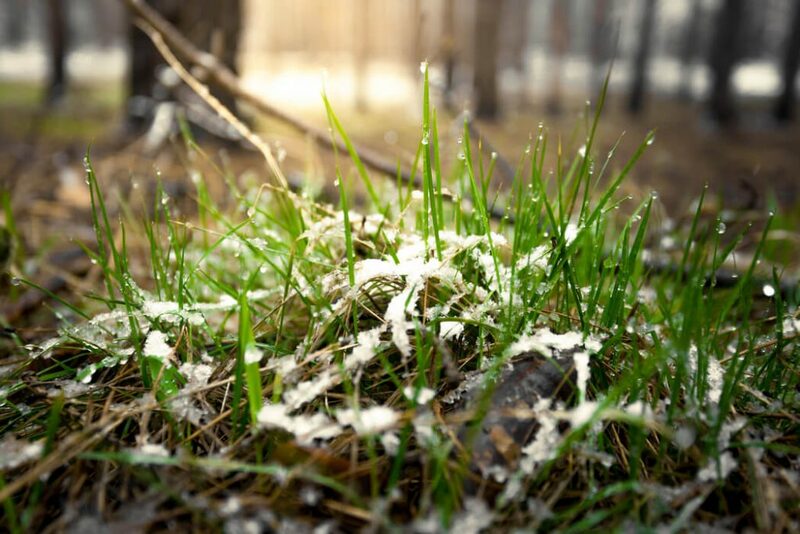 If you care for your lawn in the springtime, it will have a stronger chance at being healthier all year round. Do you have other questions about how to care for your lawn? Ask our experts your questions.